Although some of these techniques may work in the short term, today’s consumers are savvier and pickier than ever. Only brands that truly care about consumers and provide consistent value will be rewarded with long term loyalty. So, if you’re interested in treating people like people, eliminating “meh” content, and making the internet a better place… let’s chat! First and foremost, everyone we work with MUST genuinely care about consumers. This is not us just being idealistic, but also strategic, because consumers know whether you’re truly looking out for them or only out to make a quick buck. Simply caring about consumers is not enough. Our goal is also to make them better at life. Meaning? We go beyond the what (your product / service) and into the how (your campaigns, email marketing, UX, social strategy) to see what we can improve. The aim being to ameliorate and empower consumers rather than baiting, wasting their time, or causing cognitive leaks. 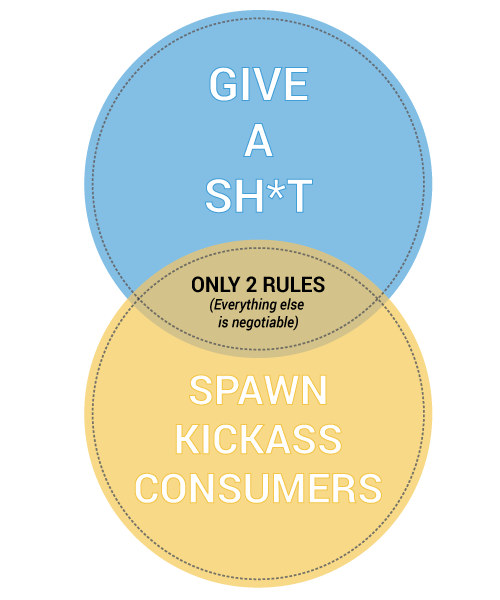 Only then, can you spawn kickass consumers. More than just complementary colors or a pretty logo, branding is the foundation to your relationship with consumers. We help you clarify your brand and strategize on how to get people to care now and long-term. The days of consumers conforming to your office hours are long gone. Thanks to technology they can now discover, fall in love with, and judge you and your products 24/7. Your best weapon? The content they find when they search (i.e website, social media, reviews, free ebook) or the content that finds them (i.e emails, digital advertising). So you better make it good! Building relationships with the right influencers (press, bloggers, fanatical customers) can make a tremendous difference in your success. However, bigger is not necessarily better. Rather than force relationships with big fish, we’ll align you with the right groups and outlets for maximum engagement and conversions. In today’s highly competitive landscape, the old spray & pray model of aimlessly blasting consumers with halfhearted messaging has been rendered completely useless. For rapid growth, your marketing needs to be strategic, targeted, and proactive, constantly A/B testing and improving quickly based on results. 1. No BS: If I’m not what you and your company needs, I’ll promptly refer you to whoever is. 2. My Super Power: Ability to quickly identify and satisfy people’s intrinsic motivations (it’s what makes me great at my job and at attracting the best talent…plus really fun to work with). 3. Ideal Clients: Growing B2C brands who value a long-term, direct-to-consumer approach, with a penchant for grassroots and non-traditional consumer strategy. *Entrepreneurs: If this sounds like you and your company, email me. An A-player can do in a day what could take someone else months to achieve. But finding all stars is useless if you don’t also create an environment that inspires their best work. The key is matching the right people to the right projects and then convincing them to find the time (since all stars are usually already employed or busy with their own projects). Sorry, no name dropping, but know that everyone paired with a client is there because they’re excited by the project and those on the team (all stars attract all stars). *All stars: If you’re the best at what you do and looking for something worth your time, email me. Whether it be through drool-worthy copywriting, imagery, or campaigns, we know how to grab people’s attention in interesting and creative ways (that also convert really well! )…without costing you a pretty penny. For example: Create a national holiday, host a city-wide scavenger hunt, design packaging that inspires, befriend influencers in a genuine way, get customers invested in your company / culture / employees, etc.